It really does seem kind of nuts. New York PoNY, yes that PoNY, won Nationals this past weekend in San Diego after beating San Francisco Revolver, yes that Revolver, 15-7 in a final that felt more like the fall of Rome than a game of ultimate. Amidst all the speculation about what all this means for the future of the Men’s Division, it is perhaps getting lost just how stunning this news would have been even two years ago. PoNY are national champions. Up until the moment they scored that final point, this seemed impossible: PoNY just didn’t exist in the same atmosphere as teams who could actually win a title. They filled a different niche in the ecosystem, that strata of teams whose purpose was providing some color for the real protagonist’s montage. This characterization seems doubly true for PoNY. No team in the modern era1 has won a title in the Men’s Division without making semis at some point previously. But more than that, when was the last time that a team cast so narrowly in a role was able to break out of character? Up until this season, PoNY was, to most of the community, a Twitter account first and a team second. The biggest story involving PoNY last season was this one, which at the time seemed like a good use of the internet. They were the pranksters in the back of the classroom, throwing spitballs and cracking jokes, always featured in the yearbook but never on the honor roll. While waking up to find PoNY at the top of the podium was surprising, it would be an oversight to dismiss what has happened as an accident of history. The team’s story, while not steeped in immense on-field success, has been setting them up for this moment. Just like life in the city it comes from, PoNY’s continued existence in the face of unenviable circumstances has been a victory. 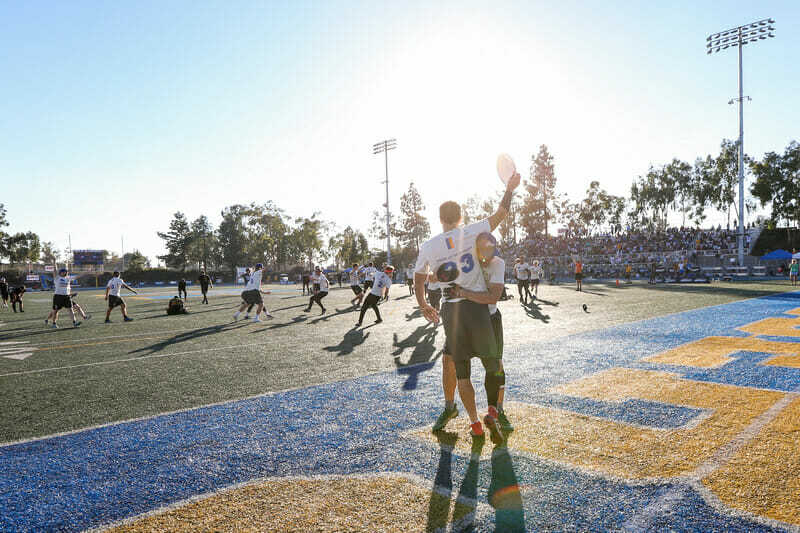 Through years of trial, PoNY’s players have developed a team culture that made this team the perfect home for this moment. For what is now, somehow, their moment. 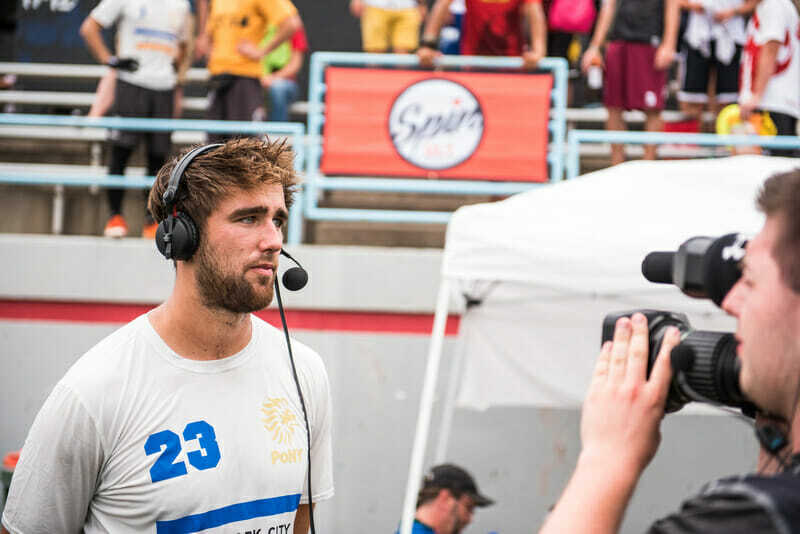 From the very beginning, PoNY’s biggest obstacle has been the brutal realities of playing competitive ultimate in New York City. The sheer size of the city, the hallucinatory nature of the transportation system, and the challenge of finding fields better than a patch of dirt somewhere under a bridge in deep Queens make for a logistical nightmare that weakens the body and kills the soul. Luckily, there have been a few people in New York crazy enough to give it a try. As the last vestiges of the legendary NYNY teams were burning out in the early 2000s, some young players looking for a fresh start grabbed a few drinks in an endearingly scuzzy spot in the East Village. They left having formed a new team, with visions of grandeur fit for the city that would provide the backdrop. It was one of those nights, as PoNY founder Alex Masulis reflected, “that everyone has, where you have the spark of an idea and after a few rounds it builds on itself and starts to seem realistic.” But while most of us never end up writing that screenplay or starting that business, this barroom reverie became a reality. Oh, and the name of the bar? The Pink Pony. 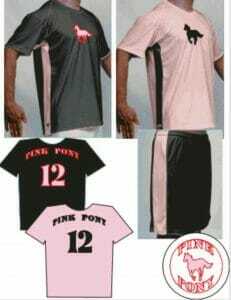 The original jersey mockup for Pink Pony, designed by Noah Levine. PoNY first took the field in 2005, steadily improving until they made Nationals for the first time in 2008. By that point, PoNY was the preeminent team in the New York area and was becoming a fixture around the country. But the same challenges that made getting a team off the ground in New York were magnified as the team’s ambitions increased. It’s tough to get people to commit to playing at all in New York. It’s really tough to get the kind of commitment that is needed to make a team the best in the world. Even those committed to the team’s success where hampered by the realities of New York life. Field time was always a struggle, as Masulis recounts needing to bribe a city official with bottles of bourbon to ensure access to a reasonable playing site. As for the field sites that didn’t require a bribe? “A field in name only,” recalled Masulis. “You’d be lucky to touch a blade of grass. Plenty of rocks, possibly syringes.” The team spent years practicing on a field in Red Hook, Brooklyn, that is now condemned by the city as an environmental disaster site. The Pink PoNY is closed, too, driven away by rent increases. These struggles forced PoNY to create an environment that made the sacrifice and commitment of playing elite ultimate worth it. Talking to veterans of the team, it was the camaraderie and personality of the team that kept PoNY alive. “You need to get guys excited about the idea of the team,” said Masulis. If it seemed like PoNY was inventing the most fun persona of any elite club team over the past several years, that’s because it was true. Investing in their own identity when it became hard to invest in the the results on the field created an atmosphere that supported a complete squad of players. A team that was able to take everyone’s strengths and abilities and meld them into a unified whole. From 2008, the team’s first bid to Nationals, through 2016, PoNY never made it to the quarterfinals. Two years later, they became one of four active teams to have won a Men’s national title this decade. According to players new and old, this isn’t a coincidence. The team’s culture took pride in the beauty of just continuing to exist. It wasn’t a failure if the team didn’t win Nationals; it was a success that they were able to take the field together at all. This healthy outlook prepared PoNY to channel all the new talent acquired over the past year into a positive environment, where it could survive and thrive in moments of peril. The old guard was able to absorb the new without losing the best aspects of either. The coaching staff encapsulates this balance, of insider and outsider making something better than what either could do alone. Ben Van Heuvelen is a dyed in the wool Pone who played with the team for nearly a decade before becoming a coach. Bryan Jones is an outsider to the system, who worked his way into the orbit of the team by grinding as a coach in unglamorous college positions and doomed AUDL efforts2 before hooking up with PoNY. Both BVH and Jones bring something essential to the table. It was Jones’s defense that managed to finally solve the Revolver riddle that has stumped the Men’s Division for the past decade. Jones had been spending years dreaming up schemes for how to break Revolver, the biggest challenge in the sport, and PoNY gave him the opportunity to take his shot. Meanwhile, BVH’s history with the team and relationship with elite players has made him the perfect coach for an offense that found itself needing to blend together a staggering mix of talent and personalities. Both pieces shone in the final, with the offense going nearly turnover free and the defense dismantling Revolver brick by gold-medal-adorned brick. The players had something to do with it as well. The easiest place to look for how PoNY managed such a rapid change of fortune is the arrival of the best player in the world. It is rare for PoNY to pick up such a blue chipper, as New York doesn’t have the same level of college programs as other major cities and people have moved to New York for a million reasons but almost never for frisbee. Things have started to change, with the team’s tight-knit culture creating a legitimate recruiting pull. Of course, just having Jimmy Mickle doesn’t guarantee a title. Keeping that culture intact while adding new pieces is more difficult than it may seem. But according to the players, the culture on the team is what made the wheels turn all year. The same attitude and camaraderie that DQ and Jody were building over the past decade came to fruition. “More than any other team I’ve ever been on, we truly believe in each other and celebrate everybody’s individual achievements and accomplishments,” beamed two time National champion Sean Keegan moments after PoNY clinched their championship. For the founders of PoNY, seeing their vision of the team on display like this was emotional. The team that they set out to create and the identity that they worked so hard to nurture was what they saw in San Diego. Avirgan speaks appreciatively of the way the current crop of players are keeping the spirit of PoNY alive, and how much it has moved him to see their success. “I sat there on the couch and cried for about 30 mins after the final,” he said. Quaranta feels a sense of closure for the mission of PoNY that began back in 2005. “Alex [Masulis] and I talked about wanting to build a team that would outlast us. Wanting to build a team that would be around long after we stopped playing,” he said. And after this season he believes the goal has been fulfilled. Maybe this seems unintuitive, for unity to be a defining characteristic of a team that has so often been shaped by its physical separation and inability to literally come together. But in that way, PoNY’s story is the story of New York. A city defined by the diversity of its people and the hardship of living there, integrated by the accomplishment of survival. Playing for PoNY is at once an impossible thing to do and also the only way the players can now imagine wanting to play, just as New Yorkers believe strongly that the struggle of making it in New York is what makes it undeniably the best city on earth. Sure, this may be exceptionalism, but isn’t it refreshing to have some exceptionalism to talk about that isn’t Revolver’s? Getting from that night at the Pink Pony to the pinnacle of the ultimate world wasn’t easy. The team has changed from the guys that ran around the Lower East Side back in the early 2000s. But ultimate is different, and frankly so is New York. What hasn’t changed is a culture born out of adversity, that learned to survive and eventually thrive, because of it. PoNY has beaten Revolver. They’re king of the hill. Top of the heap. They made it. Comments on "The Jester Stole His Thorny Crown: New York PoNY Is Atop the Ultimate World"